The wasp is a medium sized flying insect and is well known for its black and yellow markings on the body. These markings often lead wasps beings confused with bees but they are neither bees nor flying ants. They are found in all the countries of the world except for the Polar Regions. There are approximately 75, 000 recognized species of wasps over the world and grow to a length of 2/3 inch. Wasps are critically important in the natural control of their population. The wasp is known for its poisonous sting which can be very painful and can also be fatal as some people are allergic to them. The stung area can swell and form a lump that takes a few days to soothe. Did you know when the wasp dies it releases a smell (called a pheromone) which warns other wasps of the lurking danger and is an indicator that help is needed. Just like many other species of insects the wasp is known to be a social being. As many as 10,000 wasps are thought to inhabit one nest. The queen wasp who is the only breeding female builds the nest using a papery substance made of chewed wood and plants. Despite their bright colours (which serve to warm predators) wasps are preyed upon by different animals including birds, amphibians, reptiles and various species of mammal. Being omnivorous wasps eat a mixture of plants and other animals. They prefer to eat sweeter plants and feed on nectars, fruits and honey. They also eat insects and even large caterpillars. They are known to become very aggressive during the months from August to October during which time their food preference shifts from insects to food and garbage. This is also the time when they can come in contact with humans and attack them. 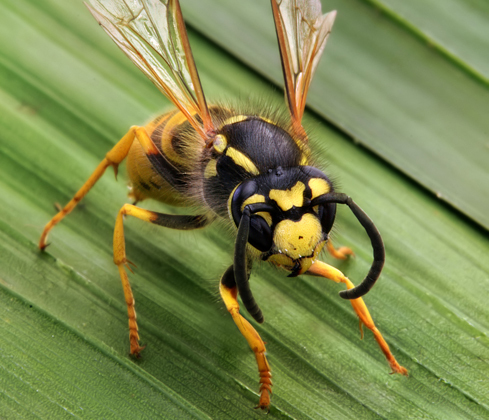 Wasps are only active during the daylight and they can be usually found resting in their nests during the night time and so this is considered to be the best time to eradicate wasps. All female wasps are not fertile and the first group of wasps to be born is one of sterile wasps. The queen wasp is helped by some fertile wasps in increasing the population of the nest in the beginning. The other fertile wasps lay eggs in the beginning but eventually become sterile, when there are enough wasps in the nest. If you have a problem with wasps, let the professionals, Pesky Critters help you get rid of them for you!